One of the most popular destinations in Asia, Vietnam abounds with natural and cultural splendours that are second to none in the region. When you venture away from frenetic Hanoi, you will discover the untouched natural beauty and charming people of northern Vietnam. 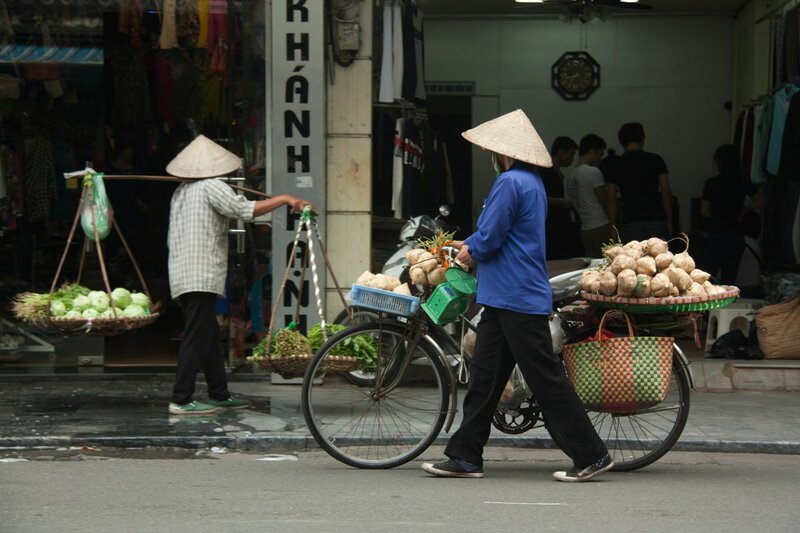 We cycle through a series of traditional villages, towering karst mountains, refreshing forest, and fertile rice fields and see Vietnam in a new perspective before crossing the border to Laos for more action. We stop for a visit to Vieng Xai, aka The Hidden City, with hundreds of caves used to shelter the Laos Communist Party combatants during the Second Indochina War. The ride then continues into the Nam Et-Phou Louey conservation area, where you’ll enjoy a night safari on a long-tail boat and stand a great chance of spotting exotic wildlife. The next stop is the famous Xieng Khouang Plateau, the resting place of the Plain of Jars, a tentative World Heritage site. The region is also one the heaviest bombed during the American War, otherwise known as the Vietnam War. Cycling among mysterious stone jars and bomb craters, we’ll learn about the significance of the plateau, which dates back to the Bronze Age. The tour culminates in Luang Prabang, a UNESCO World Heritage site renowned for its colonial and vernacular architecture, glittering Buddhist temples and ascetic saffron-robed monks. Since this ride takes us along the roads less travelled, overnight stays include a village-managed eco-lodge and basic guesthouses to provide you a good rest after challenging days in the saddle. We meet in Vietnam's capital of Hanoi for dinner and a trip briefing. A day exploring the countryside and local artisans. We start riding on a dyke along the Red River, a perfect quiet place to get used to cycling in Vietnam as we make our way to Tam Coc. A flat, scenic ride takes us to Hoa Lu and Dinh Le Temple, built in the shape of a Chinese character. We explore Vietnam's first and largest national park with a visit to the Endangered Primate Rescue Centre, home of rescued and rehabilitated native monkeys, gibbons, and langurs. We cycle through dramatic mountain landscapes along the Buoi River. A transfer uphill means a descending ride past rice paddies to Mai Chau. Take a stroll around Mai Chau valley before we transfer to the top of the hill and ride downhill to Dong Tam. After lunch we'll continue cycling west towards Laos and along the way you will be treated to the dramatic scenery of mountains, rivers and local villages. We cross the border in the morning, and our Laos guides will lead us along streams and farms to the historic Vieng Xai caves, once the war-time headquarters of Laos’ communists. We cycle amongst the vast network of caves, which were used as shelters from air raids during the Vietnam War. After lunch, we cycle to Xam Neua, Houaphanh’s provincial capital. Today we will have a rest from the bikes and and go on a different type of adventure, a safari in the Nam Et-Phou Louey National Protected Area. As we enter the park, we stop to see Saleuy Waterfall, and in the late afternoon, we boat upriver so that we can drift down in the evening to spot wildlife. It's back on the bikes today after a short transfer. We cycle down to the Xieng Khouang Plateau and to the Ban Xang Hot Springs, where we’ll be staying the night in a community lodge. This morning we ride to the town of Phonsavanh, but on the way, we'll stop for a cool down and lunch at Tad Ka Waterfall in Tachok and hike a spectacular jungle trail that winds its way up and crosses the waterfall. An easy day to visit the mysterious prehistoric jars. We return to town for lunch and the afternoon is free to visit the MAG Office-UXO Visitor Information Centre and gain an insight into the legacy of the Vietnam War to the region. We head east to Phou Khoun via Nongtang, a large natural lake surrounded by high limestone cliffs. We explore the temple ruins, visit a cave, and have lunch. After, we continue cycling for another 27 km be-fore transferring the final uphill section. We have an overall descent to Luang Prabang. However, before we go down, we have 40 km of up-and-down riding. We then descend 20 km and have lunch at the bridge over the Ming River. Then we decide if want to continue riding and conquer one more mountain or to transfer to Luang Prabang. We ride to Pak Ou to visit the Buddha-filled Tham Ting and Tham Teung Caves. We return to Luang Prabang by boat, with a stop at Ban Xang Hai. Return to your hotel to freshen up before your onward journey. Day 2 - Hanoi - Tam Coc Ride 58km. +315m / -311m. Just finished Remote Vietnam and Laos tour. What a great experience every day. The route was most enjoyable, the food and scenery - fantastic. Most enjoyable were the mountain climbs. Mr. Choy is an excellent guide, great local knowledge. A great representative for SpiceRoads and Laos. Fantastic trip which really delivered the remote experience in both Vietnam and Laos, awesome climbs with plenty of great local food to fuel us. I would like to mention Mr. Choy our guide in Laos, he is a great representative for SpiceRoads and a real gentleman. His knowledge on Laos and willingness to provide information was fantastic. He went out of his way to ensure our holiday and the cycling was enjoyable and provided a great variety of food for us to sample and enjoy. His cycling ability was fantastic and attention to detail on safety for our group was impeccable. The driver in Laos was very attentive as well. I enjoyed this cycling trip and it delivered the remote experience. Fabulous! A journey full of wonderful surprises. Enchanting scenery, beautiful souls and delicious nourishing delights. The biking each day was varied, and the route mainly off the beaten tracks. I loved the challenge of the hills which were always going to be achievable purely because of the encouragement and support from both the guides and drivers. A magical memorable holiday. Thank you! I would like to make anew additional comment about Xue, our Laotian guide. He is a big asset to your team. I was very impressed by his eagerness and willingness to learn and please. He was very polite, kind and genuine, but professional, knowledgeable and enthusiastic. His winning smile and zest for life was infectious and both my husband and father agree, he really made our trip. Biggest thumbs up for Xue. I would definitely want to do another trip with SpiceRoads. A very professional team. Thank you all. You can cycle a total of up to 761 km on paved roads along rivers, through lush paddy fields, karst landscapes, and peaceful villages before taking on some climbs to truly appreciate the natural splendours. When the climbs are tough, we lowered the distances to make it manageable. The journey takes us on a route less frequented; therefore, some overnight stays will be basic at guesthouses, and there will be one night with shared facilities. Suitability: You can expect a full day of riding each day with some challenging ascents for you to overcome, but they mean nothing compared to your flying down the long descents we have purposely included in this program. The tour can be enjoyed by anyone with reasonably good physical condition. As is always the case, the fitter you are, the more you will enjoy the riding. However, an air-conditioned bus travels behind the group for support. Biking Conditions: We ride between 30 and 70 km per day, with the option of cycling 100 km one day. We also have 1 rest day along with 2 half-day rides. The roads are predominantly tarmac and in relatively good condition, but occasionally you will experience sections of deteriorated road surfaces and small sections of dirt roads, which makes it all the more exciting and adventurous! We meet in Vietnam's capital of Hanoi. You have time to explore the city on your own before we gather for dinner and a trip briefing. A day exploring the countryside and local artisans. We have a short transfer out of the city to avoid traffic and start with a lovely ride on a dyke along the Red River, a perfect quiet place to get used to cycling in Vietnam. Our first stop will be Bat Trang, known for its handmade ceramics. The pottery is quite varied and interesting. We then cycle south into the heart of the delta, passing through many traditional villages and rice fields. We have a two-hour transfer to lunch in Tam Coc. In the afternoon, it's back on the bikes to ride a bit off road amongst karst cliffs to a small pier. We board a boat for a leisurely cruise on the Ngo Dong River and float through three natural caves, the largest of which is 125 m long. Sit back, relax, and see rural Vietnam from a different perspective, taking in the dramatic limestone karsts jutting out from the green rice fields. We disembark and cycle back through the karst cliffs to visit Thai Vi Temple, one of the oldest temples in Vietnam, built in the 13th century. We start cycling from our hotel in Tam Coc for a flat ride to the town of Hoa Lu, the ancient capital of the Dinh and Ly dynasties. The route is stunning as you pass green rice fields amongst karst mountains. After a stop to visit Dinh Le Temple, built in the shape of a Chinese character in the 17th century, we continue pedalling along the Hoang Long River through some impressive landscape. The first 35 km are flat and then we'll have some small climbs up to the park, but they are all short. Upon arrival at Cuc Phuong, Vietnam's largest national park, we visit the Endangered Primate Rescue Centre, where a wide variety of native monkeys and gibbons, including critically endangered langurs, were saved from wildlife smugglers and are being rehabilitated to return to the wild. After the visit, we continue cycling to the centre of the park and have the option to transfer or cycle the 20 km back to our overnight accommodation in the park. After breakfast, we take a short transfer to Lanh An, where we start our cycling on a small tarmac road with dramatic mountain scenery and along the Buoi River. We cycle past local villages of Muong people and their fields of rice, corn, cassava, and sugarcane. After a lunch of Pho at a local restaurant, we have a short transfer uphill to start our afternoon ride with a descent to Mai Chau, as there is no better way to enter this paddy-filled valley than by bicycle. We arrive with plenty of time to enjoy a dip in the pool or the sunset view from your balcony at our luxurious lodge. After breakfast, take a guided stroll around Mai Chau Valley, where we can admire the superb panorama of Mai Chau surrounded by a green valley and stilt houses. Be sure to bring your camera! Back at the hotel, we check out, hop on the bikes, and cycle from Mai Chau to deep inside Pu Luong National Reserve. After 20 km of flat terrain, be ready to start pushing the pedals as we conquer the biggest hill of the day with a 550-m climb over 17 km. But the effort is well worth it for the exhilarating downhill cruise to Dong Tam. We have a picnic lunch en route at a stilt house of ethnic Thai people. Once we reach Dong Tam, we load up the bikes to avoid construction and transfer 35 km to our hotel in Quan Son. 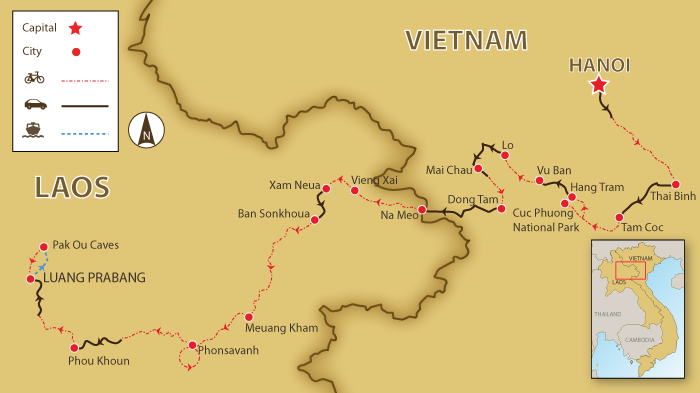 This morning, we transfer 53 km to the border, where we'll be met by our Laos guides. We acquaint ourselves with our new bikes and start our ride to Vieng Xay. Our ride will be along streams and through karst landscapes interspersed with rice paddies. Our destination today is historic Vieng Xai, once the war-time headquarters of Laos’ communists, famous for its remarkable landscape of karst limestones honeycombed with caves that were used as shelter during the relentless bombing raids. Along the way, we’ll see a number of historic caves, including the Lao-Cuban Hospital Cave. After breakfast, we head to the Vieng Xai Caves Visitor Centre to get our bearings and get ready to go on the audio tour. The Vieng Xai Caves are an extensive network of caves in limestone mountains. Four hundred and eighty of these caves were used by the Communist Party army to shelter from American air raids during the Second Indochina War, also known as the Vietnam War. We use our bikes to get from cave to cave and walk through the caves listing to the commentary and audio effects. After lunch, we get back on the saddle and cycle to Xam Neua, Houaphanh’s provincial capital, through a number of traditional ethnic villages. We have a rest and go on a different type of adventure, a safari within the Nam Et-Phou Louey National Protected Area. The area is known for its forest, high level of biodiversity, and endangered species, including tiger, gaur, Sambar deer, and white-cheeked gibbon. We transfer from Xam Neua to the starting point of this adventure in Ban Sonkhoua. Along the way, we stop to see the 100-m long cascade over rock slabs of Saleuy Waterfall. When dusk comes, we head out for wildlife-spotlighting down the Nam Nern River on long-tail boats that drift downriver for the best chances of spotting wild animals. We overnight at simple but well-appointed bamboo huts with the sounds of the jungle surrounding us. After breakfast, boats will float us back to Ban Sonkhoua, where we get on our bikes to start riding again. Today is all about magnificent downhills! Our first spectacular descent will bring us to lunch on the Nam Nern riverbank in Ban Sop Lao. After lunch, we transfer to Ban Souanmon, from which we’ll cycle through the mountains towards our second outstanding descent onto the Xieng Khouang Plateau. The day ends at Ban Xang Hot Springs, where we’ll be staying the night in a community lodge. After a hot spring bath and breakfast, we start our traverse of the plateau, which is home to the mysterious Plain of Jars, a World Heritage site. We ride through numerous villages and have an overall gradual climb for the first part of the day as we end up at 1100 m from our start point of 500 m. Once we are up on the plateau, the landscape changes to grassy plains. This area was one of the most heavily bombed in Laos and evidence of unexploded ordinances (UXO) are everywhere. Resourceful locals use bomb casings and other remnants, putting them to use as fences, tools, vegetable planters, decorations, and barbecues. We cycle to visit the mysterious prehistoric Plain of Jars and learn the many theories of their existence. We start with a visit to Site 1, where there are also many visible bomb craters, and continue to Site 2, where the jars are set up on a hillside. We have lunch at Site 2 and then you have the option of cycling the 20 km back to town or taking the bus. You have the afternoon free to visit the MAG Office-UXO Visitor Information Centre to watch their movie for a fascinating insight into the legacy of the Second Indochina War, aka the Vietnam War. There are numerous restaurants in town, and you can choose which you prefer as dinner is on your own tonight. We head east to Phou Khoun with the first 50 km to Nongtang, a large natural lake surrounded by high limestone cliffs, a relatively flat ride compared to our previous hills. Stop for a photo of the lake, and then it's a quick 27 km, as the last 14 km are all downhill, on to our lunch spot on the Nam Chat River. We transfer the final 60 km uphill to Phou Khoun. We arrive in time for you to enjoy the sunset and stunning view from your guesthouse. We have an overall descent to Luang Prabang, a UNESCO World Heritage Site located on the banks of the Mekong River. For those that want to cycle more, they can leave early from guesthouse and be picked up 32 km along the route. We then all transfer up 20 km to our starting point. From here, we have a glorious 18-km descent to Ban Khoua Nam Ming. Here we have lunch and prepare for a 14-km post-lunch ascent. We have one more swooping downhill before we are down on the rolling flats. We ride into charming Luang Prabang and to our riverside guesthouse. We head out to the temple-filled town to have our last dinner together. The final day of the tour consists of a bike ride to Pak Ou for a visit to the striking limestone Tham Ting and Tham Teung Caves, set in a cliff at the confluence of the Ou and Mekong rivers. The caves are packed with thousands of Buddha images. On the cycle there, we stop at Ban Xang Hai, where you get to watch Lao rice wine production and do some sampling too! After lunch at Ban Pak Ou, we’ll be returning to Luang Prabang by boat. We return to the hotel around 3 pm, so you can freshen up before your onward journey. Because some people can't imagine going on a trip without their own beloved bicycle, we do not provide them as part of this tour. However, you can hire bikes locally for the price listed in the tour pricing section. The bikes in Vietnam are Trek X-Calibers, and in Laos they are Giant Talons; all with lightweight alloy frames, 24- to 27-speed gearing, disc brakes, and Shimano components and front suspension. If you bring your own bike, please make sure it is a mountain bike, preferably with front suspension, in good mechanical order.